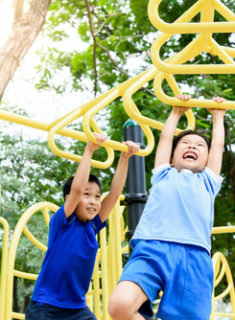 For children of all ages, summer is an exciting time to take a break from their normal day-to-day routines in order to explore new ideas, try new things, and meet new friends. At Discovery Point Towne Lake, our summer camp provides children in Woodstock with plenty of opportunities for hands-on activities and skill development while encouraging them to have a blast. We’ve created a summer camp program based around important themes that inspire children to see the superhero in themselves. With engaging children’s literature selections as the cornerstone of our program, campers can experience the magic of making real-life connections with their favorite stories and characters. Cooking projects including the challenge of building the very best sandwich. Physical challenges to help children understand the amazing machinery of their bodies. Science experiments that give campers a better understanding of the environment. Field trips full of adventure and discovery. Educational talks with uplifting messages that remind children about important values. Competitions that encourage team-building skills while allowing campers to have fun as they build relationships with each other. Arts and crafts to provide children with the opportunity to create something straight from their imaginations. Unsolved mysterious that require campers to use their noggins as they embark on a full-on investigation. Self-reliance tasks that inspire campers to be creative and resourceful. Each week offers a new “mighty mission” inspired by an engaging piece of literature hand-picked by our child care experts. These mighty missions offer context for all the activities we offer, ensuring that campers are able to make a connection between the lessons they’re learning and the skills that they’re building. At the end of the summer season, campers will understand that being a superhero isn’t necessarily about having superhuman strength or being able to fly. It’s about being a good friend, challenging oneself, and making every day an adventure. Learn more about our summer camp opportunities in Woodstock today. Call Discovery Point Towne Lake at (770) 592-0190 or drop by our child care center for details.